In the summer of 1891, Monet began to paint a row of poplar trees that lined the river Epte near his house at Giverny. The trees were auctioned off for timber shortly thereafter, but Monet made a deal with the purchaser to delay cutting them so that he could continue to paint the trees through the autumn. Using a shallow rowboat that had slots in the bottom capable of holding several canvases at once, Monet painted twenty-four pictures of the poplars from his floating studio. The resulting paintings reflect the view at different seasons and times of day and were known as the Poplar Series when they were exhibited in February 1892. Monet's efforts to record the scene were so exacting, one friend reported, that the artist sometimes had only seven minutes to work on a particular canvas before the sunlight shifted on the leaves. This particular painting is distinguished by the strong vertical presence of three tree trunks in the foreground, offset by a sinuous line of trees that winds along the riverbank in the distance. Vigorous diagonal brushwork in the reeds lining the riverbank and in the leaves of the receding trees suggests a windy day in autumn. Jennifer A. Thompson, from Masterpieces from the Philadelphia Museum of Art: Impressionism and Modern Art (2007), p. 76. During much of 1891 Claude Monet worked on a series of paintings depicting the tall, thin poplar trees that lined the River Epte near his home at Giverny, France. Painting from a small boat, he worked on several pictures at once, exchanging one canvas for another as light and weather conditions changed during the day. 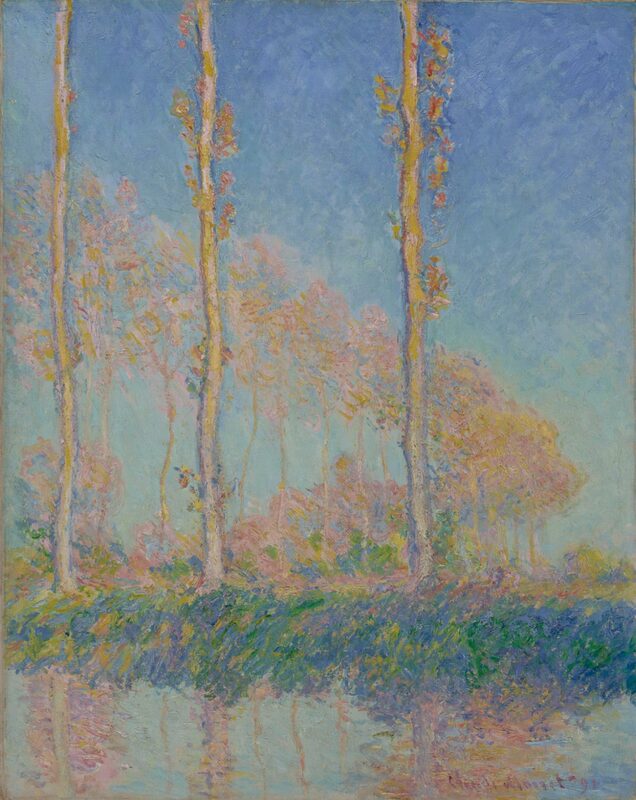 When he learned that the poplars were in danger of destruction, he and a wood seller bought the trees, his partner agreeing to spare them until Monet had completed his work. Moving up and down the river, the artist chose certain groups of trees, capturing them and their shimmering reflections in the water under changing intensities of sunlight and shadow; this painting is one of several, full of the golden light of autumn, that focus on three poplars in the foreground and a great arc of trees curving away beyond. Monet's second great series exploring motifs in the French countryside--his "Grainstacks" had come a year before--some fifteen "Poplars," including this canvas, were first exhibited to rapturous acclaim at the Galerie Durand-Ruel in Paris in February 1892. Christopher Riopelle, from Philadelphia Museum of Art: Handbook of the Collections (1995), p. 209.